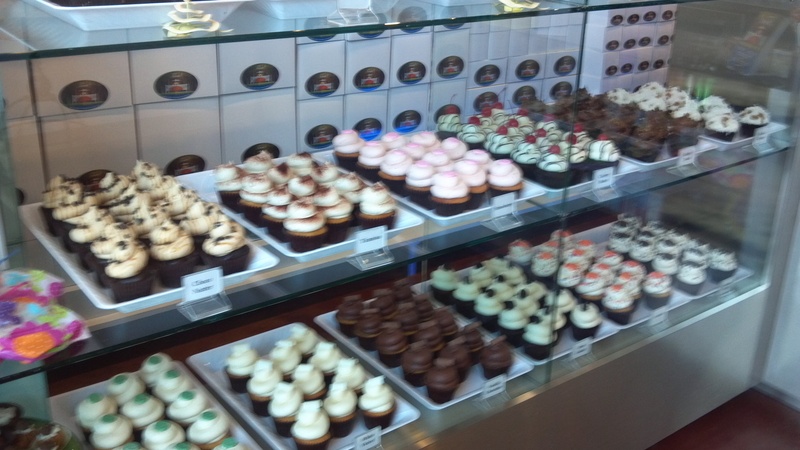 As I started having a cupcake withdraws, I consulted my “to try” list of Houston area bakeries. Lucky for me, I found a special “treat” up north of Houston. Treat! Cupcakes in Vintage Park was soon to be crossed off my cupcake bucket list. This cake was a real simple, plain cake. Not too much sweetness to it, but just an understated satisfying flavor. This frosting was no way near being understated! The frosting was speckled with real vanilla beans, and was rich and smooth. The flavor was balanced well between vanilla and butter. 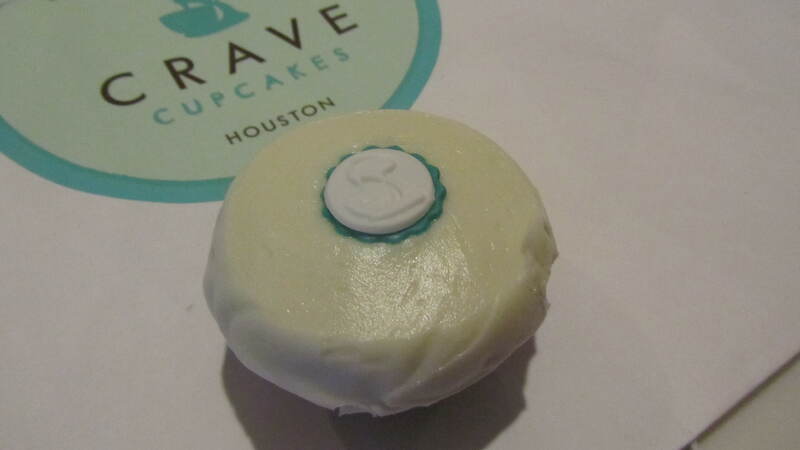 The cupcake sported a classic look—a giant swirl of frosting, topped with a branded “treat” fondant button. The vanilla cake and frosting complemented each other. The powerful sweetness of the frosting was subdued by the simplicity of the cake. You get what you pay for here! First of all, the cupcake was fantastic! On flavor only, it’s worth it. But, it’s an extra special treat when the cupcake is sized and priced accordingly—a rarity these days. The only disappointing thing is they don’t make many options with the vanilla buttercream. Most of the cakes were made with cream cheese or another flavored frosting. 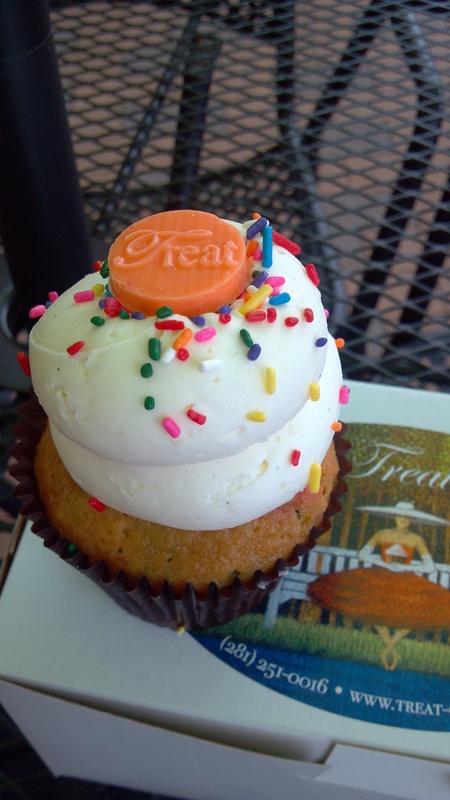 I would argue that Treat is one of Houston’s best cupcakes. It would be so dangerous if they had a location closer to downtown Houston! As Treat says, “You should have only the best… We all deserve one!” I couldn’t agree with you anymore! A new trend coming for 2012 is mini desserts. Based on the health and economic trend, smaller desserts are a way for people to enjoy without the expansion of their waistline or the shrinking of their wallet. Petite Sweets in Houston was smart before their time. This store has all sweet treats you would want, just in petite form! Walking inside, the store is an array of colors. All of their macaroons are made in every color under the rainbow and in every flavor you could imagine. Although, I wasn’t there to try their macaroons, I was in awe and had to pick up a box for a friend’s birthday. I was there for the cupcakes! 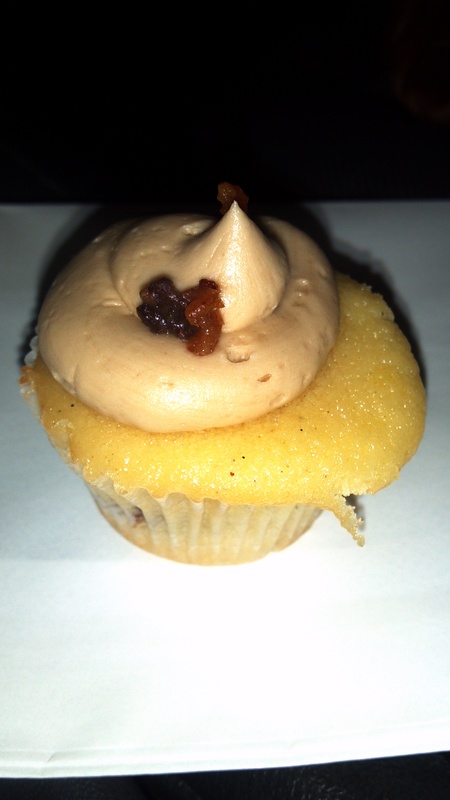 Because they were small in size, I allowed myself to get two – the vanilla-vanilla and the maple jam cupcake. A great vanilla bean specked cake. I really enjoyed the flavor, but it was a little dry. A good balance of vanilla flavor added into the buttercream. Melt in your mouth creamy! I was extremely disappointed with the quality of their presentation. It didn’t appear that they had any sort of quality control for the cupcakes. The edges and tops were uneven and the frosting looked thrown on. Also, it looked like the frosting melted a bit, creating a blob of frosting on top. I enjoy this concept and will frequent them often for their other sweet treats besides cupcakes. They make everything in-house besides the custard and gelato. The macaroons looked to be their specialty too. If they would just add wifi, I think it would be a great place to grab a cup of coffee and sweet treat and get some studying done! On a little tour through the Heights with the parents, we stumbled across a cupcake house—What’s Up Cupcake. Of course I wanted to go say “what’s up”, so we stopped in for an afternoon pick up of sugar and caffeine. Cake a little dry and thick. However, it had a good vanilla flavor, with speckled vanilla beans throughout the cake. It was a very typical vanilla buttercream. The butter was so rich that it melted into the cake, making it a good combination. 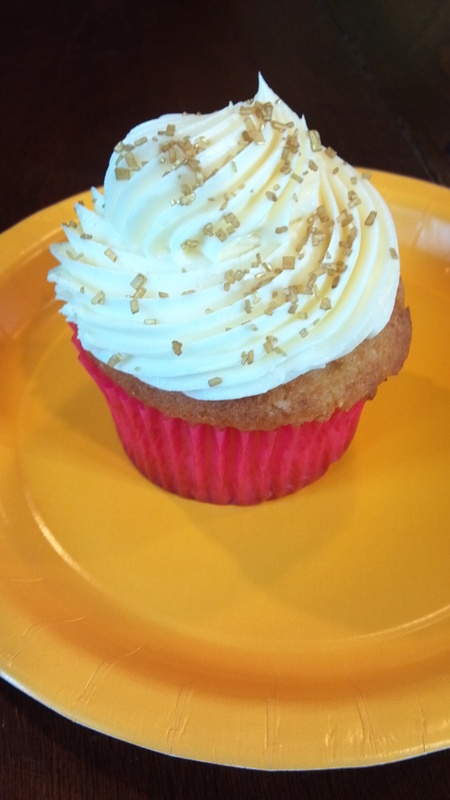 A simple design… just topped with little gold sugars. I’ve seen their truck drive around through town, but visiting the shop is a must. The shop is this house-turned-into-bakery, with fun cupcake memorabilia throughout the shop. My favorite was two little chairs fit for children enjoying their little treat. Overall, it had a very homey feel and would be a great place to spend the afternoon. I preferred the other flavors I got to try. My parents had the red velvet and the hummingbird. The cream cheese frosting was delicious! Look at all of these options! Hunting for new cupcake places is always an adventure. 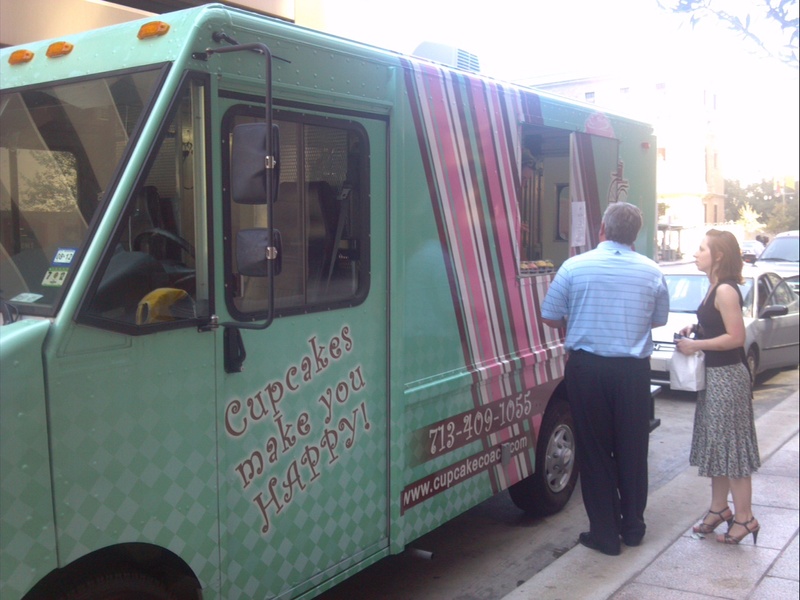 I quickly discovered that Houston had cupcake trucks… my favorite kind of cupcake shop! However, trying to track down a truck in a new city (especially when my Garmin is my only lifeline) was a quite the challenge! But, I don’t let much get in my way of a cupcake! Giddily, I walk up to the window and order their vanilla cupcake. Baked to the right consistency, this cake was perfectly crumbly and moist. Also, I tasted a strong vanilla flavor. This frosting was definitely a buttery vanilla. However, I really had to search for the vanilla flavor. It was much thicker than I care for… it needed some time to reach room temperature before it felt smoother and the flavors really popped. 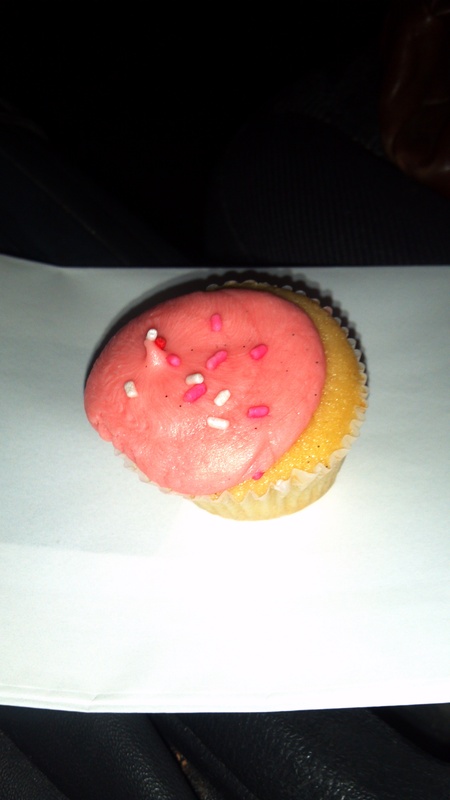 It had a simple look, pink colored with a few rainbow sprinkles. I was happy to see that it had the right ratio of frosting to cake. Always important! 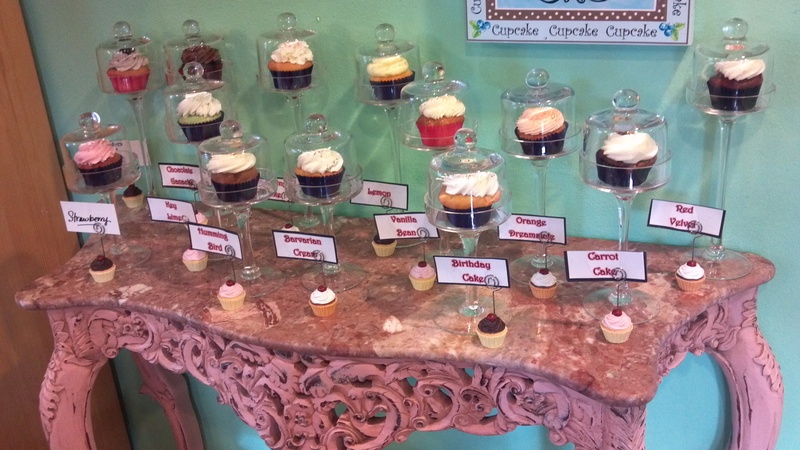 They carried only a select few flavors of cupcakes, and the flavors didn’t wow me. It was a limited menu with simple, popular flavors. I do believe that cupcake was too small for the price. However, they did package it in a nice container that kept it safer while transporting. It was a very clever of them to have a refrigerator on the truck. There is no way the little cakes could survive Houston heat! There just wasn’t anything special about the vanilla cake that would cause me to make a special trip to go back. But, if I did come across them, I would be interested in trying some of their other cupcakes. The cupcake up to the test was the Italian Cream – a Vanilla butter cake with toasted coconut and walnuts, topped with a sweet mascarpone cream cheese frosting. Cakes with mixins are always a bit tricky to get right. A baker must be careful to cook the cake without letting the filled pieces dry out the cake, make it too moist, or sink to the bottom. The vanilla butter cake had a richer flavor than typical vanilla cake. I didn’t care for the toasted coconut, however, the walnuts were a nice crunch. But, the cake immediately surrounding the walnut pieces (especially the bigger pieces), was a bit doughy. However, the rest of the cake cooked well. Wow, what a delicious twist to the cream cheese frosting! The addition of the mascarpone cheese made the frosting creamier than your typical cream cheese. I loved it! I couldn’t have enough of the frosting! Very simple, modern decorations. 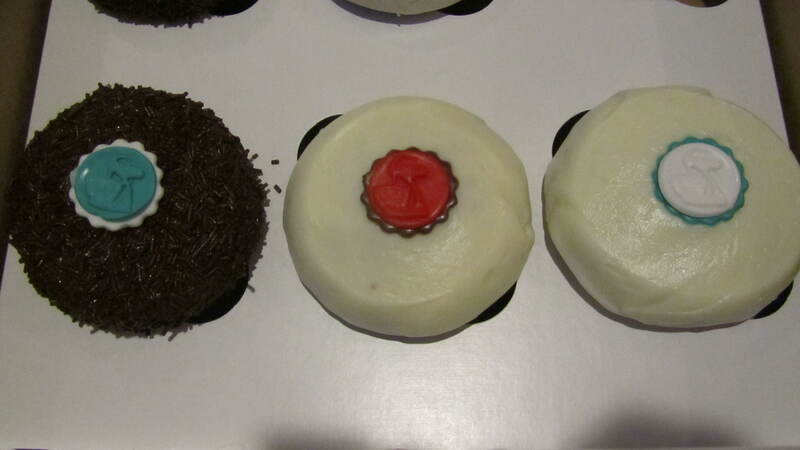 Each cupcake had a button with the imprint of a stand-up mixer. Underneath was an accent color button. I enjoyed that the frosting was spread edge-to-edge. It’s very important for every bit of cake to have frosting. I didn’t like the top-to-bottom cake ratio. The top over-extended from the base of the cake which gave the perception of a bigger cupcake. Also, that shape makes it difficult to grab the cake out of the box. Yum, yum, yum! This was a very tasty cake! I also tried their red velvet and dark chocolate. Both delicious! 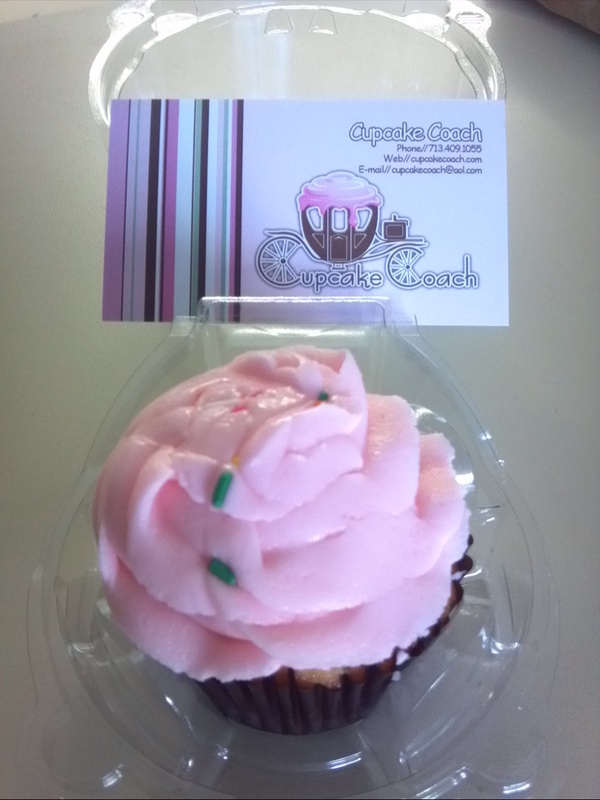 I can’t wait to visit a Crave Cupcakes shop. First of all, you can see all the action of the baking and decorating of the cupcakes! Also, they offer “breakfast” cupcakes and their own special blend of coffee. Their menu changes daily, so there’s something new to try each day! How Far Close Are You? How far close are you? – a question that one of my very dear friends asked on my first night upon moving to Kansas City. Translation – Where are you? Well, I feel this question is the only one to ask right now. Considering this is my first night in my new city, I needed to let you, my sweet friends and readers, where I am located. This summer, I decided to pursue my educational goals and accept my admission to the Master of Science in Hospitality Management program at the University of Houston’s Conrad N. Hilton College of Hotel and Restaurant Management. Sadly, this means I will no longer be around all the great cupcake shops in Kansas City nor discover any more of the city’s sweet secrets. However, as I’ve always stated, I will follow my sweet tooth wherever that may lead. So, for the next two years, I’ll be exploring and tasting all of Houston’s finest and sweetest places. And, I hope more time will be on my hands to get back into the kitchen for more baking attempts. Thank you to all of my sweet friends and readers. I’ve had so much fun bringing you my finds and opinions in the cupcake world. I hope you continue to follow my journey!